Since debuting their new 'Comfort Print' typeface in 2018, Thomas Nelson has released two single-column reference bibles in standard (~6" x ~9") and compact (~5" x ~7") sizes. To cut to the chase: these editions both represent an incredibly reader-friendly layout, with full cross-references at prices that won't disappoint. Both editions have the following items in common. They both have sewn bindings with two ribbon markers that are 1 cm | 7/16" wide and pleasantly long. Both are black-letter editions with book, chapter, and cross-reference superscripts in red, which makes for a pleasant but not distracting contrast. Even though the pages are different width, both have an approximately 1 1/4" outer margin which contains the cross-references that are justified to the bottom of the page. 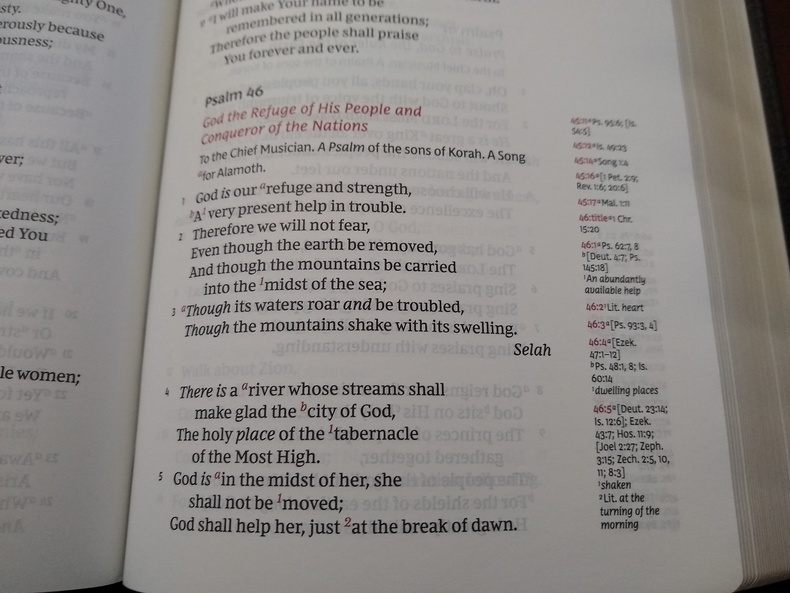 The references in the side margin include both cross references and the NKJV textual notes (which are second to none among translations). 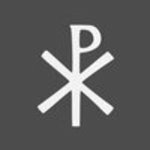 I also noticed that there are also notes explaining some of the traditional but less commonly used terms, a nice compromise to retain our rich, inherited Christian vocabulary while still being understandable in a contemporary setting. Of the 1 1/4" margin, toward the top of the pages the entire margin is free for notes, if desired. Towards the bottom, where the cross-references are printed, there is approximately 1/2" left over--not enough room for notes but the proportions are satisfying to the eye. These editions were typeset by 2K/Denmark, and both layouts average between ten and twelve words per line, using line matching for a very pleasant reading experience. The standard size edition has a 10.5 point font and is super easy to read, even under poor light. This edition has a one-year reading plan between the concordance and maps. 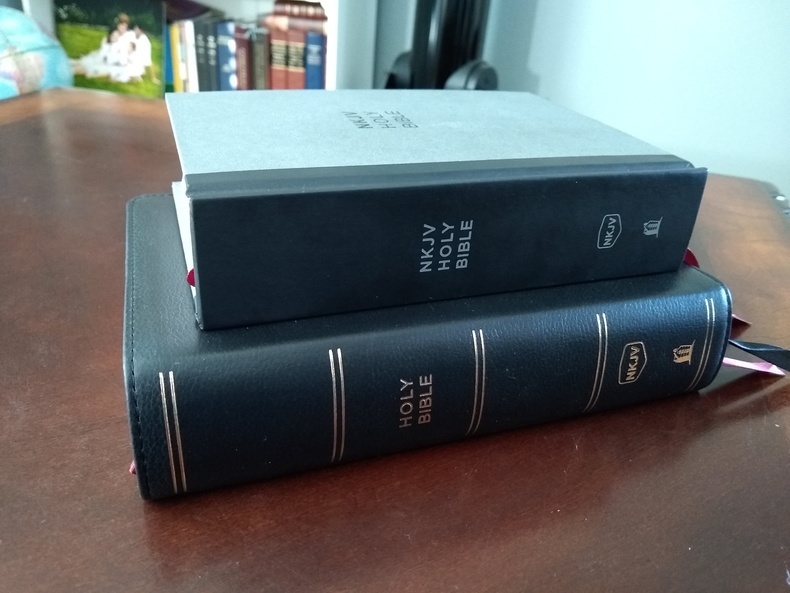 The compact edition uses a 9 point font, which is larger than many other similarly-sized bibles I have on the shelf and is still plenty readable to my mid-40 year old eyes, though some may prefer the larger font size of the standard edition. 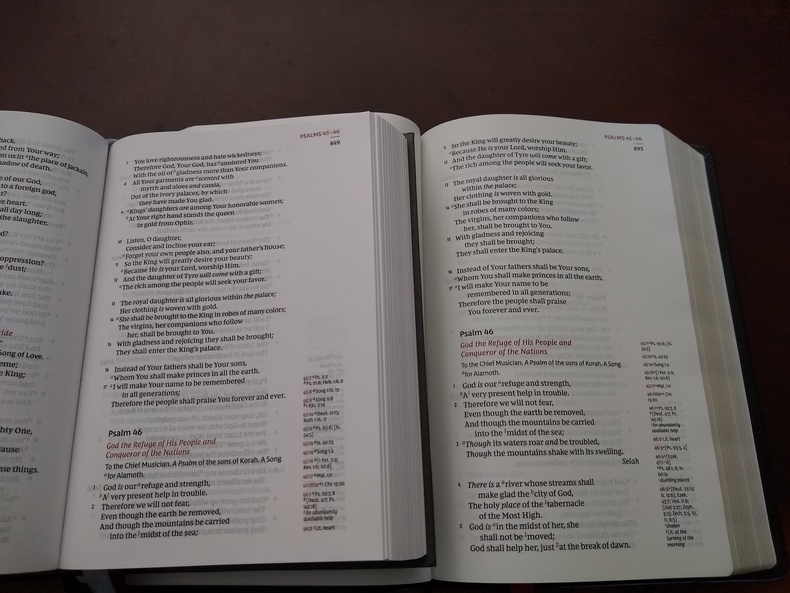 For some reason, even though it appears to have the same concordance and map set, the compact edition does not have the one-year reading plan, which is surely not an issue as reading plans are easily found online. Thankfully, single-column bibles are much more prevalent than they were a decade ago. That said, layouts as stunning as these with cross-references are still a rarity, and Thomas Nelson has surely come up with a winner in these two editions. If you're a fan of the NKJV, one of these editions deserves a place on your desk and in your hand!